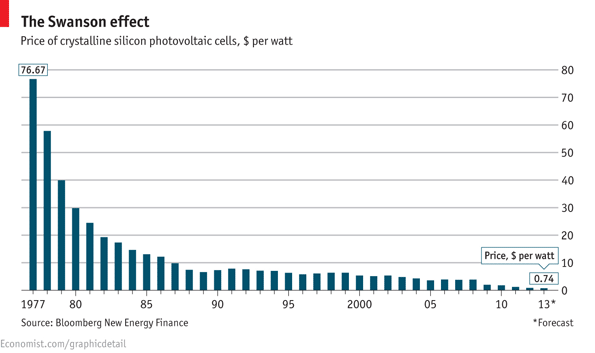 Solar Panels Price – never a better time to go solar. The price of solar panels for generating electricity in Ireland was until very recently prohibitive to install. Only the the most enthusiastic, the most green and some of those most fearful about climate change were pioneering enough to install solar panels despite the cost. But now the market has completely changed in Ireland and Irish solar panels price s have fallen significantly to a point where electricity generated by solar panels is now cheaper than the electricity you can buy from our electricity utilities. That’s a strong statement but I’ll repeat it for clarity – the price of the electricity generated by solar panels is now cheaper than that which you can buy from the grid. Why isn’t everyone installing solar panels then? Well they will eventually but for now the issue is up front cost which seems to be the main barrier. The unit price of electricity purchased from the grid comes in at somewhere between €0.16 – €0.18 per kWh, solar panels price is somewhere around €0.14 on a 2kW system over 20 years or even better €0.13 over 25 years. To get this you need to pay about €5900 ex VAT up front (the cost of the system installed) and use the energy as it is being produced. The added bonus to this is that once the system is installed there is no inflation or energy price rises to account for – you have pre-bought your electricity at today’s solar panels price s. For any forward thinking individual this has to be a good thing, for any forward thinking society this is an absolute must in the face of climate change and energy security threats.